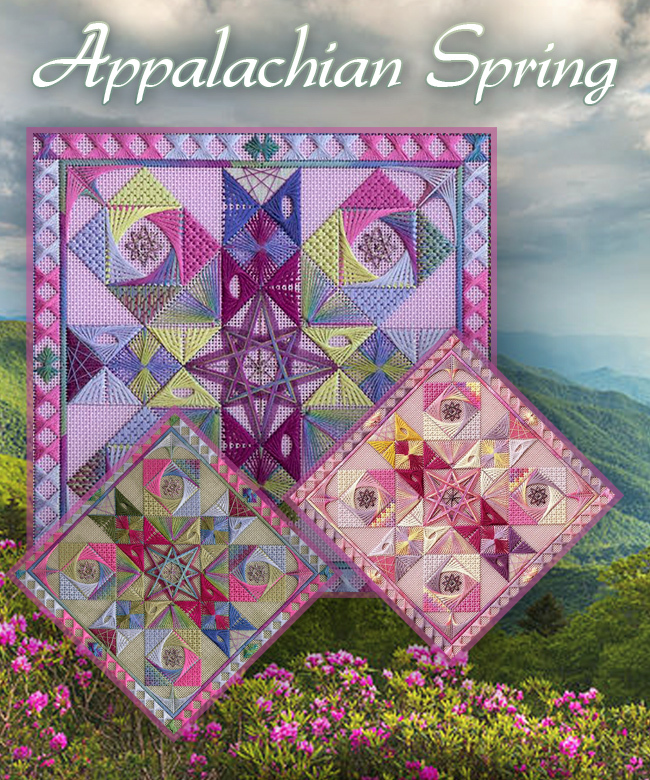 Appalachian Spring is inspired by a traditional quilt design. The finished design size is approximately 8 inches square. The working canvas is 12 inches square. The design is worked on 18-mono canvas. It features threads from the Caron Collection: Watercolours, Wildflowers, Waterlilies, Impressions hand-dyed, Impressions and Soie Cristale; and, Kreinik Braids. Stitches used in the design include: backstitch, slanted Gobelin, eight-point star, double fan doubled, Sprats Head, triangular Jessica, upright Gobelin, plaited ray, square Jessica, dagger Amadeus, Greek cross variation and Rhodes.